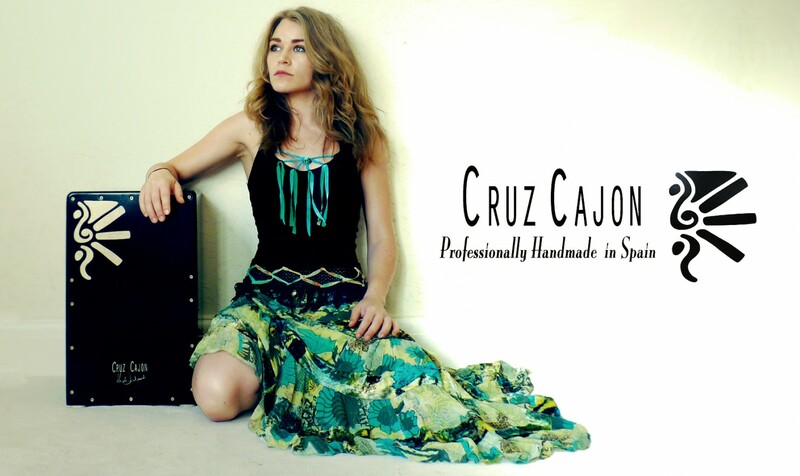 Cruz cajon is Heidi Joubert’s new professional, signature line cajon brand handmade in our Cruz Cajon workshop in Spain by our very skilled and experienced artisan team who take pride in their work, and take time to diligently hand craft each instrument for maximum quality and sound. Specially designed to last years, promote good posture and aid in developing a great technique. no other cajon in this price range can match this quality or standard!! the cruz cajon has never looked or sounded better! 5 star quality sound, fast rebound response and big volume! After the handcrafting process, they are finely tuned and then they are then taken through a testing phase and approved by our professional cajon team to ensure it matches the highest possible standard. 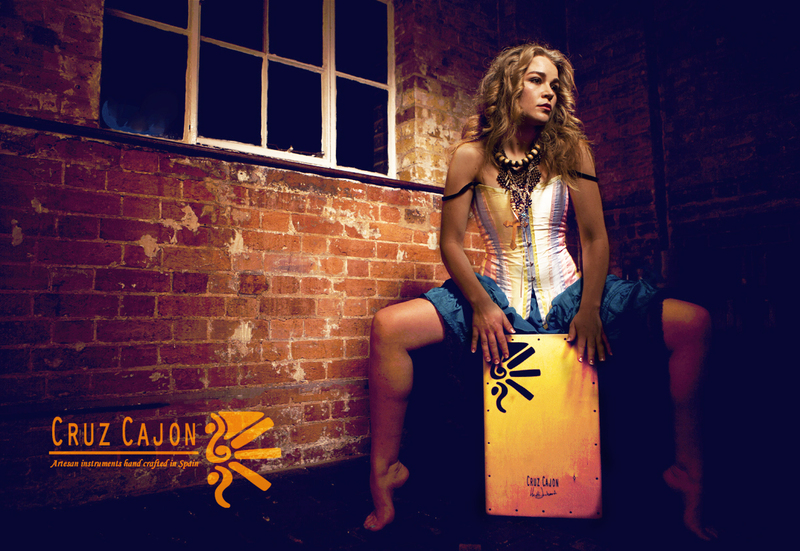 Each cajon is then tested and played by Heidi Joubert before it gets carefully packed and posted with our super fast and reliable courier, no other cajon in this price range can match this quality or standard! Each Cajon is quality controlled and comes with its own unique number and certified seal of approval. The sound quality is superb and so is the playing action, with an extremely fast rebound action and the bass sweet spot in the best and highest possible position, the cruz is an effortless joy to play. 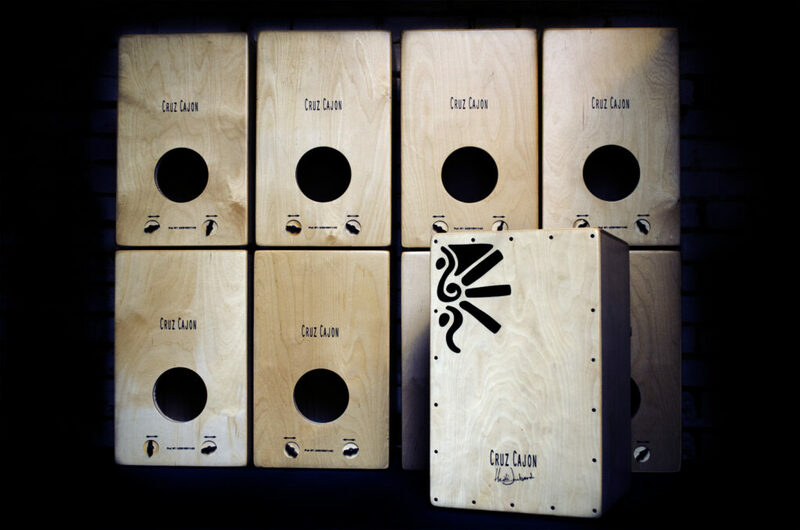 It is well known that some cajons can create health and posture issues in the long run if the bass notes are situated too low on the cajon, resulting in having to stoop down everytime you hit the bass note. This also builds up a very bad technique which is hard to unlearn. 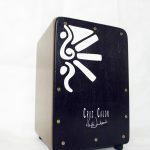 It is because we believe it is of vital importance to take care of your body and your technique that we have specially designed our cruz cajon to not only look and sound great but actually aid you in obtaining the correct posture and building the correct technique. The bass “sweet spot” is situated as high as possible, just below the “snare” for the optimum posture when playing the cajon. It has a deep powerful bass with a beautiful resonance and a neat, crisp attack on the highs. The separation between the highs and the lows is very neat and distinct, needless to say these are fabulous for live playing, acoustic playing and recording! It is really effortless to get a great sound out of the cruz cajon! Available in black (Cruz “Toro” model) or natural (Cruz “Leon” model), More colour and customised options coming soon! Now with an advanced improved guitar strings tuning system that helps prevent buzzing and rattles commonly found in cajons. Personally Designed and drawn by Heidi Joubert. There are different models for cajons, please see our shop page for more info. Depending on whether or not I have time after school, I may be interested in joining your Skype cajon classes. I have a few questions though. 1. Are children (I’m only 12) allowed to join the classes? 2. Do the classes require any past experience in drum/cajon playing? 4. What cajon would you recommend that I get as an inexperienced beginner? here comes the promised review about my new black toro giutar string cruz cajon. at first a have to apologise for my kraut(ed) and not so good english, sorry but maybe it’s also a little bit funny to read this denglish sentences. dear heidi, i want to thank you for all. the cajon arrived very well at home. it was really good packaged in a well fitting and protecting box. my new cajon came in a perfect condition to me. the quality of the black toro cruz cajon guitar string is really superb. this signature master cajon is handmade in spain by very skilled and experienced craftsmen, built with honor, preciseness and proudness to produce the best instrument for ambitious musicians. the cruz has a smooth and silky black surface, the frame looks like a one piece construction. i like the big screws of the fine sounding front plate. the tuneable string system is simple, stable und useful. it produces a very defined an airy snare sound, strictly seperated from the huge bass tone. this is really a quality and unique music instrument. the snare area is sensitive and you can hear the snary sound even you are playing quiet ticky ticky ghost notes. i didn’t have to tune so much at the guitar string system. when i hit the bass area i have little bit of the snare buzz, but i like this. its just like playing drums. there you also often have a snare buzz if for instance the bass guitar resonances with the snare drum. i think i could eliminate this, but i have no reason to do this a this time. the sound of the cajon is unbelivable rich and harmonic. you can play really (!) loud without brutal hittings or effort. on the other side if you want you can easily play very quiet with only two fingers having the full range of sound that this pretty little box contains. the sound is always wonderful. i love it. another very great advantage of the cruz is, that all important main tones are concentrated in a small area on the top of the cajon. so you can reach much more easier the tone zones. that’s why it is much more relaxing to play on this cajon than on an any other brand. i think you can use it for every musical direction, it will always fits. you get a clear definition between the kick and the snare sound with an airy a rock sizzle sound in the background. there are many more variations of sound tone impossible. in such a small area. this pushes your technique und your improvised playing to a new level. you can play different tones of snare: tight slapy, hard rim shots or a darker bass snare sound. of course the bass kick is also variable, depending how you hold your hand hitting the bass zone. Using your foot up and down on the front to change the bass tone works extremly awesome. i had never reach so much soundfull tone variations on any other cajon. i could test the cruz during some recording sessions, and ervery musician on the set, who compared the new cruz with my older and not so bad cajon, said that the cruz sounds so much better. there is another practical feature: the felt-feet have a different height at the backside, the height is more less. so the cajon is naturally tipped backwards and the front plate automaticly comes into a better position to play it easily. the black toro cruz is a nearly perfect and professional instrument. the cajon looks so nice, that i have it in my living room…so it is much easier for me to rehears on it every day ;-)). playing the cruz brings so much fun. heidi, you were right, when you said that i will love my new cajon. yes indeed i love my black beauty. I have had the Cruz Cajon for a week now and have some observations. I took it to the local music store to purchase a bag and the staff was blown away by the sound and visual quality. I got to play it next to the store offerings and am pleased with my choice. The Cruz had a better sound, was more versatile, and just looks better. The staff thinks that I am a pro and I didn’t tell them that I am a guitar player. The box has distinct zones for snare and bass at the top of the instrument and is comfortable to play. Your hands can stay at the top to save your back. That is a major selling point for us elderly or anyone that wants to put in serious time playing. The center zones have less snare so it is easy to change the sound by moving to the center of the box. The amount of attack required to practice is very low and upright. I have been trying to practice but spend lots of time riffing at low volume. I have tried cajon and other brushes that have protective covering on the handles. Cajon brushes allow a brush sound while maintaining some bass thump. You can play this instrument for hours with brushes and there are some great cajon brushes coming on the market. Brushes would also be an option for people with physical issues that want to participate. I just ordered a different set of brushes and am waiting for them to arrive. I play with and without a CajonPort to get the bass that I like for various situations. The natural un-ported bass is a pure beautiful sound that stands on it’s own and I only use the port to turn it into rolling thunder. Put your fine china in a safe place. I could prattle on but I am going to go sit on the box. I promise to practice??? how can I purchase a Cruz cajon? how much is that in dollars? . Just one word about your lessons …awesome !!!!. I am from India/Bangalore and found cajons costly here and I ended up making my own !.I started practicing it with you 🙂 on youtube. Thanks a lot for your time and lessons. wow That was amazing…infact I sold my first Cajon and made my next one ready. It was really good with a snare inside and now I have made a string cajon. I am daily visitor on your video lessons and big fan of yours. Started making it more professionally and sound and build quality is up to the market standards. Need to start creating with more graphics. Can you please help me with guidance to make one for myself too? I have been struggling to find an option that fits my pocket and obviously do not want to compromise on the output as well. Want to make one with the best possible material available in India that gives a sound output, that rocks. Hello Heidi, i’ve been in contact with your videos lessons, you are amaizing. so i decide to learned too. Watching your lessons, is like having a teacher at home. I am looking foward to purchasing my cajon from you. Thanks it’s great to hear from you! 🙂 I will be posting more videos so keep practising with them! 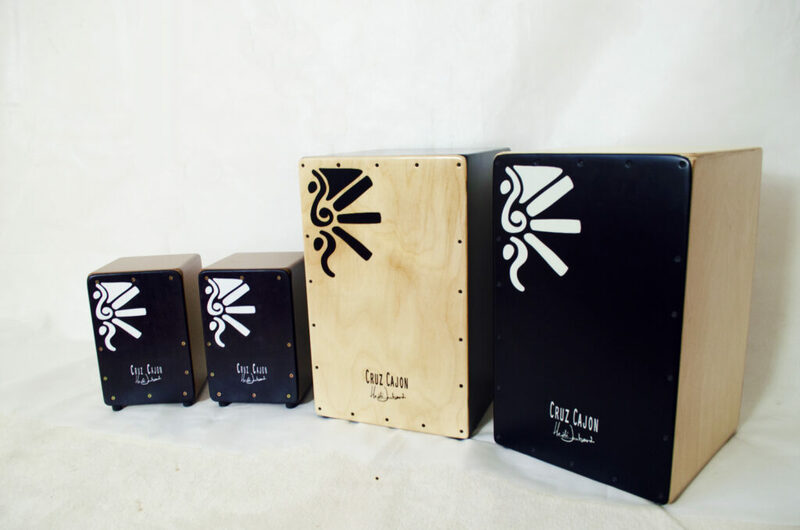 And you will certainly love a cruz cajon if you get one! I wanted to ask a few more questions about the piano wire cajon – having just spent an hour in a warehouse full of different cajons from £130 to £350!! I am looking for a really sensitive, full-on “rustlie” snare sound but also a big bass sound that doesn’t rattle. So the Cruz piano sounds good in theory. However, I would need to know just how sensitive the snare sound is. Is the piano wire adjustable? And, if you roll the fingers as you would do to imitate a snare roll for example, does it sound like a snare and is it sensitive enough to get good volume for a life gig with the fingers? The piano string is not adjustable, and the snare sound is rather tight. If you want more of a crisp snare sound (especially for the finger rolls to be audible), and a super clean and punchy bass, I would suggest the guitar string. 🙂 hope it helps! I meant Hazel. That last reply was to Hazel. You can see why I’m no proofreader, with a mistaek like that, haha! Is there a vid where the cruz cajon with piano strings is demonstrated? The Rev Andy Gray has given a great review, and the product description sounds good but I’d love to hear one at least online. I realise I could also try and visit a workshop in Cambridge but getting there could be an issue. If you are playing the Cruz with piano strings, let me know. (I seem to be adding alot of comments on this website so I may save a few and add under testimonials – it’s so comprehensive – amazing). It’s a great pleasure to have you visit my site clive, thanks again and be blessed! Hi Heidi. HAPPY NEW YEAR! No doubt like many other folk today, I am stting looking out at the rain and contemplating goals for the new year in a slight daze after the festive season. Advancing my cajon playing was one of many things on my list and your website has distracted me (pleasantly) from some of the more mundane isues on my to-do list (like moving house, keeping my job etc, he he). so THANk YOU! I am after a new cajon. Do you advise on cajons beyond those by for example PRK? I began playing a (very basic) snare cajon in Sept last year at an acoustic night at my local pub. I have a chronic back injury that has prrevented me playing guitar or drums for sometime. The cajon allowed me to participate, pain free, AND have an automatic seat (with no back pain amazingly!!). On the basis of this, I got asked to support a jazz combo where it became clear I need something of better quality. I have been looking at the Leiva Mezquita and the LP Americana snare – both for the good snare sound and distinct bass. Do you have any experience of these? Further questions and postings to come as I digest this website further. This is a great website and just the inspiration I needed on this dreary, hungover day. It is rare to find someone as passionate about something who is not …..arrogant (careful choice of words as this is a public forum!). Enjoy my website, and let me know if there’s anything you want to see here! Stuff I would like to see on here would be discussion from yourself and other players on their experience with playing live or recording, reviews of different cajons and interpreting drum set rudiments (mainly based on sanre such as paradiddles etc) to the cajon. I’m not sure there is a facility for anyone to start a discussion topic with other fellow readers and players – but that would be good too. Great set up though H. Rockadoodle-doo! My name is Tapas , i am from India. And i loved this percussion. Since then i saw many videoz in which cajon is used . Can you please tell me which cajon is used by ‘Boyce Avenue’ in that song.?? can you tell me which cajon will be good for a starter? i want to play it in unplugged performances….so which one you think i should pick….? Christmas I live in Marylebone and can come and collect it if that is pissible. Cheers Roisin. Im from same where in SULTANT OF OMAN (MUSCAT) it is a place in GULF COUNTRY near of UAE and i would like to buy PRK CAJONS but i don’t know if there is any shipping to my country ????? Why is it that the PRK Cajon are more expensive than the Cruz Cajon? Is it because of the quality of the sound, durability or the materials use? firslty, the prk has a name that has come a way, so that pushes up the price, players like pirana has played their cajon, and with a name so comes a price. Also yes, there is slight difference in the wood used for the body of the cajon, but not the tapa (frontboard), the main differences are that the prk is more refined cosmetically, for instance, it has 4 fancy tuning pegs where the cruz has the usual screw tuning system, used for tuning many of the modern day cajon strings. Also due to the body of the Prk being made of a slightly better wood, The prk has a bit more resonance and volume, but both of them have simillar sounds and tones, and they are both built to have a super powerful, clean, neat bass… So really up to what you want to spend. They are really good, both of them. I am extremely honoured that such a very nice and thoughtful person bought my cruz cajon, and also the fact that you wanted to support me is awfully kind, it means so so much! 🙂 THANK YOU! Thanks once again, I really do appreciate it! So much blessings and love to you and the family! Many thanks.Let s the music play! I’m going to be in London on Oct 8 for a day or 2 and would love to see the Cruz Cajon with a view to buying one and toting it back to the US myself to save the shipping. Do you have gigs that week where I could see them? Plan changed and I’m now going to be there from Oct 4 – 8. Is there a stockist of the Cruz Cajons in London? I work in Gower St in the West end, so would love to have a go on one before ordering a Toro off of you. Cheers! Currently there are no stockists in London, but myself 🙂 I will be having these available for sale at all my cajon workshop classes and at any shows that I might be doing with my band. If you want to, we could arrange for you to try one in London for sure! Soon I will have these stocked in various percussions stores around London but it might yet be a while.. Anyway, they are great and you really should try it if you intend to buy a cajon! let me know and we could arrange a convenient time. i’m thinking of replacing the strings in my current cajon with piano strings (until i read this i had no idea that was even an option!) can you tell me a little more about them? how expensive are they, where can i get them and how different is the sound to guitar strings.. i’m currently using A strings tuned up quite high so i get nice clean bass and snappy snare… i’m using a duende duo, would piano strings be an option? What is the current conversion rate for the USA dollar and what is the S&H fee to the US? P.S. You are a fantastic player and teacher of the cajon, I really appreciate your talent and enthusiasm. 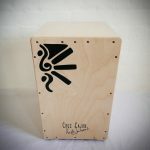 You can find the current conversion rate and the Shipping and handling fee listed on the cajon shop page. But thanks for asking, I have now added the US price and the EU price on this page to make it easier for eberyone to see it instantly without looking for it! 🙂 Remember that this does not include your customs fee (if applicable). Where can we purchase these? Are they not yet available? Hey Dusten! 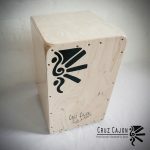 The Cruz Cajon has just been listed on the cajonbox webshop, and can now be pre-ordered from this webshop only at the moment (the pre ordered cajones will be shipped out early September, you can pre-order now and get your Cruz Cajon by 15 – 20 September in the EU). Comment faire pour commander un cruz cajon ?